The flavors are mostly heavy, alluding to the coming harvest with the sweet tones of apple and barley. Looming behind that, though, is the specter of winter, and scarcity, and cold. The bite of IPA stands as a resistance to going gentle in that good night, a fire to guide lonely travelers through the chilling dark. The stories are pulled from across SFF, with a lean toward fantasy, from contemporary to historical to second world, but there’s a hint of science fiction as well, a glimpse of the void and a voice calling out into the distance of space. 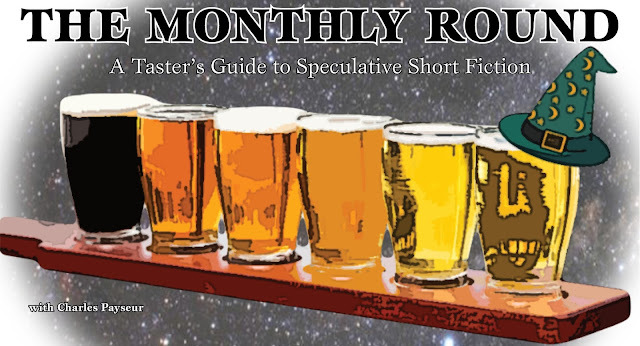 August saw a huge amount of short SFF published, and constructing this month’s tasting flight was a particular challenge, but I hope I have captured something of the season. A feeling of the growing isolation winter will bring, with despair creeping along the edges of everything, held back only by the warmth of compassion and the power of people helping people. So settle in and peruse the flavors—I hope you find something you like. Cheers! Notes:Singing with notes of sweet romance complicated by the spices of trust, betrayal, and perception, its cloudy pour slowly resolves into a golden hue that shines with warmth. Review: In the mire that is high school, Avi isn’t even out as a trans man when his name appears on a bathroom mirror with the titular warning/threat/???. Rumors flood in and suddenly (and mysteriously) Ian, the other trans boy in the same grade, wants to become friends. And, it turns out, maybe even boyfriends. What follows is a beautiful portrayal of a budding relationship, struggles with family, with depression and suicidal ideation, with trust and betrayal and, ultimately, with magic. 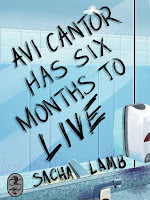 Avi is almost instantly compelling, caught between the pressures to conform and his drive to be true to himself. He faces poverty, loneliness, and a school situation ignited by this strange message foretelling his death. Through his interaction with Ian he begins to push back against some of those, even as the nature of their relationship, and some secrets that Ian has been hiding, threaten to make everything much, much worse. It’s a piece that takes an even look at depression and consent, not condemning Avi for his despair but also showing that healing is possible, that trust in the face of a hostile world is still possible. Not easy, definitely, and not without a few large complications, but possible, and beautiful. The speculative element takes a little while to show up in this novelette, but when it arrives it’s a wonderful twist on a number of tropes, casting a deal with the devil (or a devil, at least) in new light. And I love that Avi’s problem isn’t presented as him being a trans boy, but rather the lack of support he has, the way that society has let him down not only as a queer child but as the child of a poor Jewish mother, and how the story captures family in such vibrant and warm tones. There is a definite darkness to the piece, to the dangers in Avi’s life and despair he often feels, but it’s also a story about joy and hope and getting past mistrust and the betrayals of adolescence to a place of acceptance, security, and affirmation. Notes: Striding confidently into a cold landscape, the flavors only really open up as the drink finds the fire of company to cut the chill of loneliness, distance, and cruelty. Review: Life as a fox isn’t easy, especially for Rhy-lee, who inherited her mother’s wanderlust even as she was raised by her devoted father. Pulled between her love of home and her strong desire to explore, to go out and meet the world, Rhy-lee tries to find piece in building a family with her partner. When tragedy strikes, though, it becomes time for her to finally strike out, though not on her own. Accompanying her is Yfan-wyn, one of her two sons—the one afflicted with the same itch to roam as she has. And the story follows them as they embrace a part of themselves they have always denied and feared. Rhy-lee, because of how she was abandoned, because she feared hurting her family like her mother hurt her, and Yfan-wyn because it’s always been treated as something to resist, something that his mother always had to fight against. Yet here they are allowed to go, to explore, to make friends and escape danger and discover a world that is certainly not safe. But at the same time, even as the world threatened to chew them up and spit them back out, there’s something beautiful about it, about the wild wonder, the strangeness and the wider community that can exist only when the familiar is left behind and the unknown is pierced. And slowly Rhy-lee finds that what she feared isn’t the case, what her mother assumed isn’t the case—to explore and to wander doesn’t mean to give up a home. It doesn’t mean giving up a family. The action of the piece is intense but the story maintains a slower pace throughout, with a sweep of adventure and a definite sense of fun. It shows what the characters are capable of when they celebrate their drive outward, while showing how necessary it can be at times to have some place to return to, and people who will always welcome you back. Notes: A rush of different flavor variations compete for attention within the clear confines of the glass, one subtly more dominant and yet all combining into a memorable, bracing whole. Review: A four-part computer consciousness, made from incorporating four very different humanoid minds, is put in charge of a massive solar collector and tasked with providing energy to a burgeoning population. Only there seems to be something wrong with the system, and as the minds begin to investigate, a number of anomalies become clear that point to a very different (and bleak) situation playing out. The voices of the personalities are clear even as they merge at times, the four minds a gestalt, a “we,” while also allowing for individuality. That split between the individual and the consensus becomes more and more apparent as the story progresses, as the darkness and the terror of what’s happening begins to creep in along the edges of perception. It looks at how the minds within the greater whole vie for dominance and control even as they’re supposed to work seamlessly together. It’s a story that looks at corruption and a system tainted by inequality and injustice, while at the same time imagining a computer consciousness that might be starting to slip into a kind of dementia. It’s not a piece that provides solid answers, but one that provides clues for the reader to follow, an unreliable narrator struggling to hold things together. And for me it’s a story that resonates with the loneliness of space and the desperation of what might be the last vestige of an entire civilization, detached from the planet of its birth and yet connected as well, holding on as long as they can even as time takes more and more away. The style is bracing and strange but works to create an experience that blends some visual tricks and literary gymnastics to great effect. It explores memory and loss, ability and ignorance, and does it all with a keen focus and devastating impact. Notes: Deep and with a since of nearly overwhelming longing, the first sip is a punch of premise and wonder that settles into a darker and much more intimate profile. Review: The premise alone would have been enough to make me stop and pay attention to this story—a library made up of the stories lost to the world, the books that people never finish, or the works that are lost to time through accident or intentional destruction. Thrown into the mix, though, is a community of people working in this environment, ruled over by the authoritarian Librarian, for whom imagination is a sin, and populated by denizens stolen from time or made up of ideas and bits of detritus. And newly employed as a cataloger of these lost texts comes Tom, a young man on a very specific mission, infiltrating the Library in order to find a particular lost book. 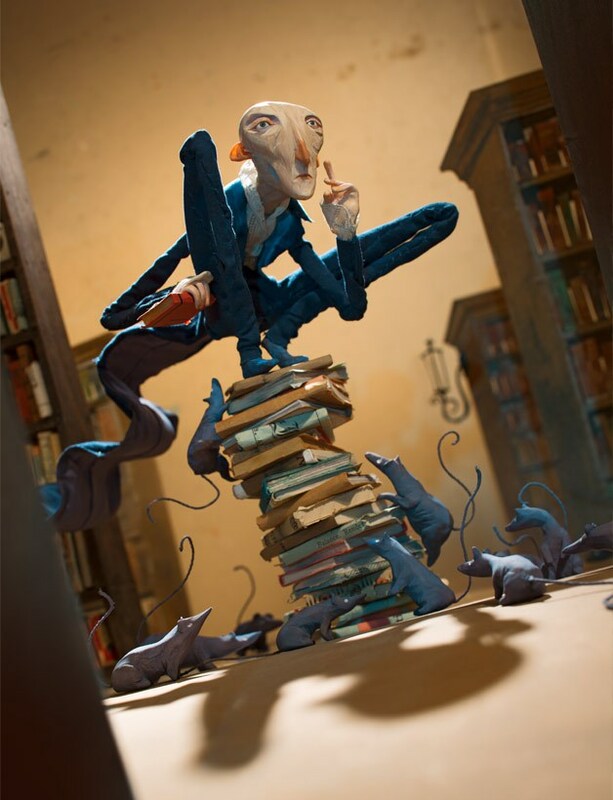 Along the way, though, he gets to know the other residents of the Library (including a few absolutely adorable Library rats), and discovers the complex and wrenching nature of this place, of history, of being lost. The story is full of longing, full of Tom’s need to hide who he is in order to pass safely before the Librarian’s scrutinizing gaze. The backdrop to the story is the destruction of stories and texts, from book burnings to moments of authorial self-doubt, and the Librarian’s voice becomes the one saying that these stories are best forgotten, catalogued but never experienced. It renders the loss of so many texts, of so many voices, value neutral, which is something that Tom cannot do, who feels the loss like a cut, like the absence that they are. It’s a story full of a heavy tension of the constant fear of discovery—Tom’s mission is largely isolating and personal, but it also allows for intimate connections and slow reach toward something better, safer, for stealing something lost and dragging it back into the light. Notes: With a nose of fire and notes of sweetness swirling into something almost chaotic and brash, the experience is breathtaking even as it is nearly violent in its boldness. 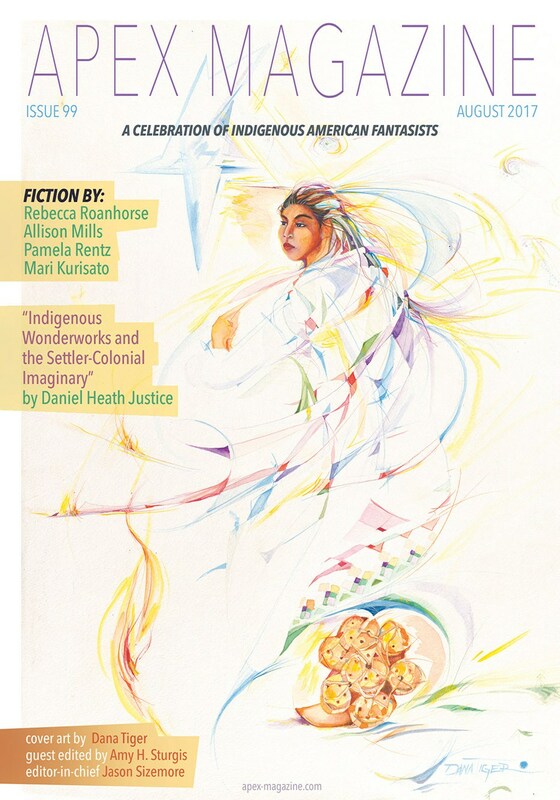 Review: At the heart of this story is a relationship, fragile in the fact that one of the people in it is something powerful and magical and dangerous, unable to contain their fire when exposed to certain kinds of light. It’s a strain between the two, who live from place to place, trailing destruction, until they find what seems a perfect place, where they can shut the rest of the world away. The story, to me, becomes about the barriers and limitations. The nature of the character means that there are things they cannot do, ways that they cannot be together because of how they would hurt each other. Where this distance is a comfort to one of the characters, though, for the narrator it is unbearable, and so they go about trying to find a way to break through that barrier, regardless of what their partner wants or consents to. And in that the story becomes about fire and which of the character’s heats is more dangerous. Certainly one of them can start buildings on fire, and yet that doesn’t hold a candle to the damage that the narrator’s passion can do, the destruction not limited to property or even life, but to something much more intangible but even more important. Because the story is about the destruction of trust and respect, how breaking through those barriers are toxic to relationships, to love. It’s not a story about monsters so much as it is about prisons. Those that people are born into because of their natures and those that people create for themselves, built with the bricks of betrayal and violation and far more isolating and consuming because of it. It’s a rather heartbreaking story, beautiful and fiery but leaving only ash in its wake. Notes: Pouring a ghostly yellow like the memory of sunlight, the drink mixes the bitterness of loss with a dim hope that persists, strong and lifting and holding on despite the grief. Review: Shelly is a young woman, the granddaughter of a real-life ghostbuster, someone who eases spirits into the next world and exorcises them from homes when they become a bit too troublesome. The story takes a very fresh and interesting take on ghosts, though, casting the most troublesome as the ghosts of animals confused over what has happened to them and showing that it’s ghosts who have much more to fear from people than the other way around. For Shelly, what starts as a way to connect with her grandmother becomes something else when she experiences a sharp loss and refuses to accept it, keeps looking to this supernatural phenomenon to try and ease the pain and grief that she feels, avoiding dealing with death by seeing it as somehow not final. The story is a mix of heavy loss and something lighter, almost fun, as Shelly learns about the way of ghosts. It’s a story about growing up and dealing with loss, learning that there is no bargaining with some things, that for all Shelly is granted power by her ability to bind ghosts, they cannot stand in for the people that are gone, and that ultimately she needs space and time to heal, not drawers stuffed with old ghosts who don’t understand what’s going on. It’s a slower story and a difficult one at times because of how understandable Shelly’s anger and frustration are, and how much harm she is capable of doing to reflect the hurt she holds inside. Even so, it’s a piece that reaches for healing and release, even if grief lingers and haunts for a time, even if pain never fully departs. And it’s also about asking for help, and allowing others in to try and ease what pain can be eased, finding comfort in family and community and finding the strength to move on and help others, especially those who are vulnerable and alone.